The family of a student who hanged himself have blamed a drug he was taking to treat acne. David Roberts, 21, had been taking Roaccutane for two months when he hanged himself near his Liverpool home. Coroner Andre Rebello recorded a narrative verdict and said there was not enough evidence to link the death with the drug. Roaccutane's manufacturer Roche insists there is no proven relationship between the drug and depression. However, Mr Roberts' father, Fred Roberts, said he could think of no other explanation for the tragedy. 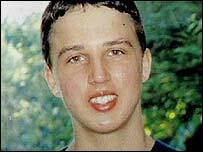 He said: "David was the most happy-go-lucky, carefree lad you could ever hope to meet. He had plenty of friends, he enjoyed going out, he had a happy family life. "His acne wasn't severe at all. He had a few spots and, like any young person, he wanted to get rid of them." Mr Roberts, of Ravenna Road, Allerton, took the drug after a friend was successfully treated with it. His father said there had been a few "strange incidents" before Mr Roberts died. He said on two occasions he was laughing "hysterically" at the television and then went for a drive in the early hours, saying he wanted to "clear his head". Mr Roberts said: "The change in him was so sudden. There's no other reason for it than the effect of this drug." A spokeswoman for Roche said the firm was "saddened" by news of Mr Roberts' death but rejected any link between Roaccutane and depression. She said: "It is worth remembering that, over the past 20 years, more than 13m people worldwide have been successfully treated for severe acne using Roaccutane. "While no causal link has been established between Roaccutane and either depression or suicide, we are constantly monitoring all available safety databases on Roaccutane worldwide."